Recent news chosen to illustrate and update Tread Softly briefings on Climate Justice. 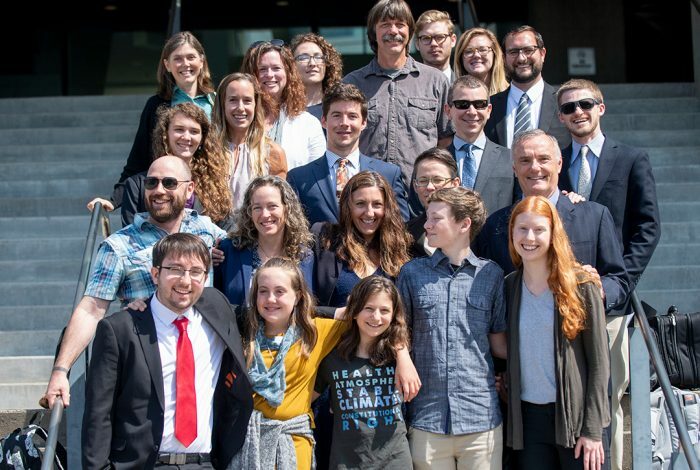 4/3/2019: More than a dozen groups filed friend-of-the-court briefs to the Ninth Circuit Court of Appeals in support of the landmark youth climate lawsuit Juliana v. United States. One brief on behalf of young people included over 30,000 signatures. 6/3/2019: Kenya could introduce insurance cover against losses incurred by households due to disasters and weather-related events, which have been increasing due to climate change. 25/2/2019: The Green Climate Fund has appointed a French UN veteran as its next executive director, as it gears up for a new fundraising round. 10/2/2019: Young plaintiffs trying to force the US government to take action on climate change are now petitioning the Ninth Circuit Court of Appeals to halt the development of new sources of fossil fuels. 16/1/2019: About 15 million people in Ethiopia work in coffee production. Scientists are warning that up to 60% of the land used for Ethiopia’s coffee production could become unsuitable by the end of the century, partly on account of climate change. 9/1/2019: Jim Kim reformed world’s largest development lender, but it continues to finance fossil fuels and his climate legacy could be challenged if the US chooses his successor.